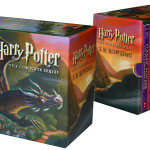 Since the release of the final Harry Potter book, Harry Potter and the Deathly Hallows, in 2007, the entire series of novels have been released in various boxed sets. 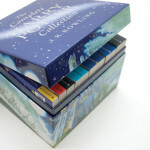 Read on to learn about these collections and the different editions and artwork they contain. 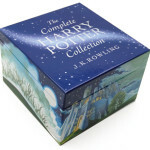 These boxed sets (paperback and hardback) include the original US versions of all seven Harry Potter books. 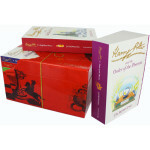 These editions have jacket artwork by Mary GrandPré, as well as individual chapter illustrations. 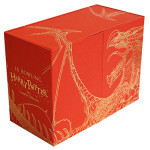 The box art is taken from the Deathly Hallows deluxe edition and features the trio flying on the liberated Gringotts dragon. 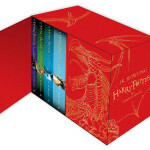 This boxed set includes the US re-release editions of all seven Harry Potter books, with jacket artwork by Kazu Kibuishi. 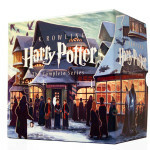 The box artwork is a new illustration of Hogsmeade Village in the snow. 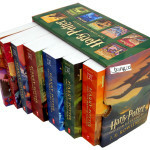 Combined, the spines of each book make up an illustration of Hogwarts castle. 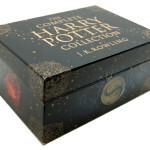 These boxed sets (paperback and hardback), also called “The Complete Harry Potter Collection”, include all seven signature edition Harry Potter books. 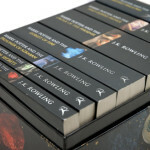 The signature editions feature new jacket artwork by Clare Melinsky. 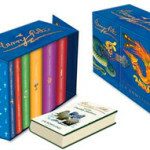 These boxed sets (paperback and hardback) include the re-release children’s editions of all seven Harry Potter books, with jacket artwork by illustrator Jonny Duddle. 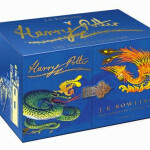 The paperback box artwork features a new Duddle illustration of the Hogwarts castle and grounds. 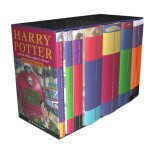 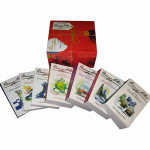 These boxed sets (paperback and hardback) include the original UK children’s editions of all seven Harry Potter books, featuring artwork by Thomas Taylor, Cliff Wright, Giles Greenfield and Jason Cockcroft. 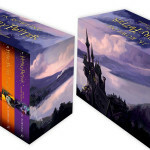 The paperback box artwork features the illustration of the Hogwarts castle and grounds from Jason Cockcroft’s Deathly Hallows jacket artwork. 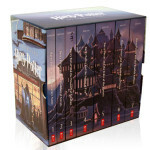 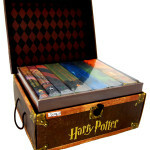 This boxed set includes the original UK paperback adult editions of all seven Harry Potter books. 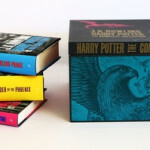 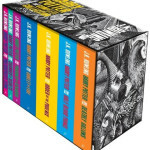 This boxed set includes the UK re-release paperback adult editions of all seven Harry Potter books, with new artwork by woodcut artist Andrew Davidson.